In the last couple of years the old Turkey Tract claim in Nevad a has been reopened. 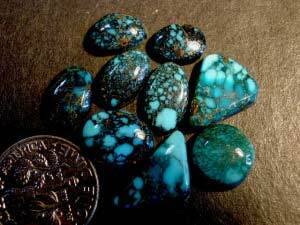 During that time some nice natural hard turquoise has been mined. But in the last few months a pocket of really beautiful dark blue, webbed nuggets were found and are being sold as Apache Blue. Unfortunately only a small amount of this dark web has been discovered. This turquoise is truly some of the nicest found in the last forty years. If you’d like a chance to own some of these top-grade Apache Blue cabs please email (info@nevadagem.com) or go to my website (www.nevadagem.com) for a look at what’s still available in the 'Collectors Corner' section. © Copyright 2015 Nevada Gem. All rights reserved. Website design by YK Design.